What to do in Naples… well we decided to take a kayak down the river. It was a beautifully hot day in Naples, Florida Saturday morning. Dressing in barely nothing was the key this Memorial Day weekend. Breakfast was 1tsp of Barley Max Powder mixed with 4-8oz of Distilled Water. After our Kayaking… I was hot, hungry and thirsty!!! So we ended up finding a Whole Foods Grocery Store, where they actually Juiced Vegetables. For my Mid Afternoon 8oz Juice Carrot, Celery, Cucumber. Then we went through the buffet line at WholeFoods where I ate a Spinach Salad with Red Onions, Lentils, Chick Peas, and Oil and Vinegar Dressing. Then I tested some of the Guacamole and Salsa and some Orzo. It was really filling. I think I may have eaten too much!!!! Back at the hotel, we showered and relaxed watching T.V. and snacking on Pistachio Nuts,. Not really interested in dressing up for dinner, we hit the Complimentary Bar on the 4th floor. I ended up snacking on some Carrots, Broccoli and crackers. I had a glass of White Wine. Unfortunately, during the night I got viciously sick and spent most of the night in the restroom. 😦 Not a good thing for our early morning Dolphin Experience Sunday.! Mike and I think the Pistachios might have been the culprit here… because he got sick too!!! I made my 1tsp. of Barley Max Powder mixed with 4-8oz of Distilled Water and started on my Mid Morning 8oz Juice of Carrot, Celery, Spinach and packed the Barley Max and Bottles of water for afternoon drinks. We were supposed to be at the Baltimore Airport at 8:40 but got there after 9am. We thought her flight would be delayed, but she forgave us anyway for making her hang out for and extra 20 minutes. Then I ordered the Crab Cake Meal and ate the Steamed Vegetables off the plate and drank my Glass of White Wine . In addition to the Carrots, Broccoli, Green Beans, and Cauliflower on the plate, I picked a couple of bites off the Crab Cake and gave the rest to Mike. Because like me, my girlfriend is also a vegan on this eating plan… but like me she cheats. So we tried to be on our best behavior, but i just got so carried away with the alcohol again this weekend. We stopped off at the Hyatt Hotel in Bethesda and had some cocktails at Morton’s Steakhouse. Then we walked around a bit more in the lovely afternoon weather and ate dinner at Hanaro Restaurant. To may surprise, this is an asian inspired restaurant where we split some Edemmome and Baltimore Crab Sushi Roll. Mike and I indulged again with alcohol, me with some cold Sake and he with a draft beer. Then I ordered a Seaweed Salad and a Vegetable & Shrimp Tempura…. Oh Soooo Good!!! I can’t even remember the meals I had since Monday afternoon of last week. So, I’m going to just come clean and admit I didn’t do a very good job of logging or even watching what I ate. As the week progressed, I did make it to my morning Pilates Classes and generally followed the menu of Barley Max for Breakfast, Mid Morning and Mid Afternoon Juices, and then a very sensible, raw lunch and dinner with a Tsp. of Barley Max 30 minutes before each. Until Thursday, when I decided to take a flight to Buffalo, New York for a weekend visit. I did pack my Barley Max and made sure I took my Tsp. before each meal. But I was not able to get my juicing in for the weekend… and my eating habits veered from the raw beat and path occasionally. There was Chocolate Cake one day, Pizza and Frozen Yogurt another day, and it seemed a continuous amount of alcohol throughout. Monday night I returned home and thus started getting back up on the wagon. I resumed my Pilates Tuesday morning, and boy am I feeling like I missed several days of classes. For Breakfast I mixed 1Tsp. of Barley Max Powder with 4-8oz Distilled Water and proceeded to make my Mid Morning 8oz Juice of Carrot, Celery, Spinach. 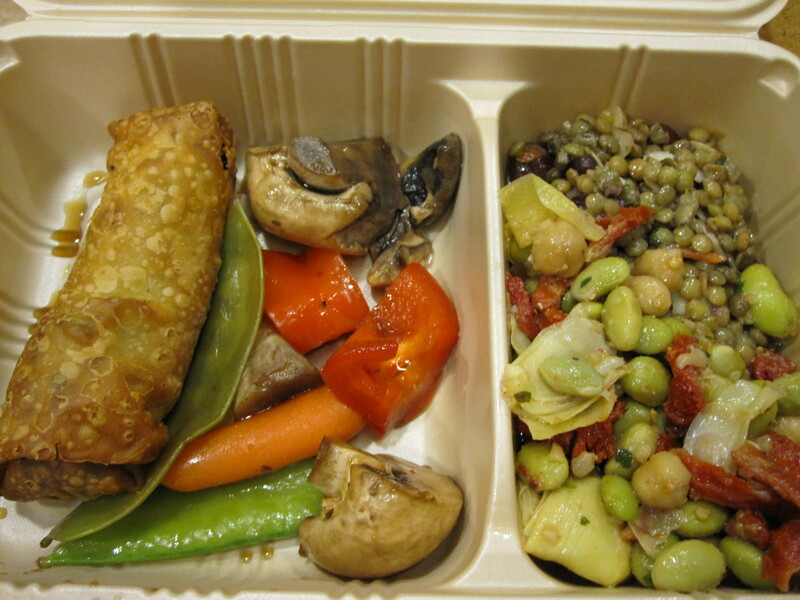 Then I had a mix of a delicious Lentil Mix, Lima Bean Salad, Vegetable Egg Roll and Stir Fry Vegetables. 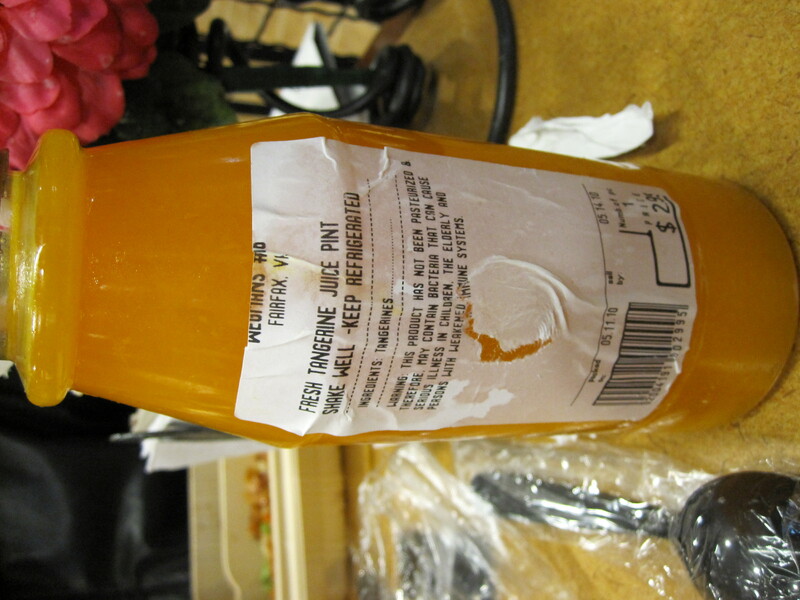 I washed this great food down with a Fresh Tangerine Juice. We came home just in time to make my Mid Afternoon 8oz Juice of Carrots, Celery, and Spinach. Then 30 minutes before dinner, I mixed 1Tsp. of Barley Max Powder with 4-8oz Distilled Water. Directions: Chop, mince ingredients and add into blender until desired consistency. Directions: Heat oven to 450 degrees, wash and cut ends of asparagus and place into roasting pan. Add the Olive Oil and remaining seasonings and roast for 15 minutes. Instead of my Pilates Class… I got up early and went to the National Cathedral for mass. Every Sunday is a good day when I go to mass… so therefore, my eating plan was spot on! I prepared my lunch to go. Because we decided to go to a festival and spend some time out in the beautiful weather Sunday. So I bagged the Sticks and pre-made the Mid Afternoon Juice and had my barley max on the go to. We came home for dinner. Where I managed to make my meal. I did however, munch on unleavened bread. More than I should have, but it tasted so good!! 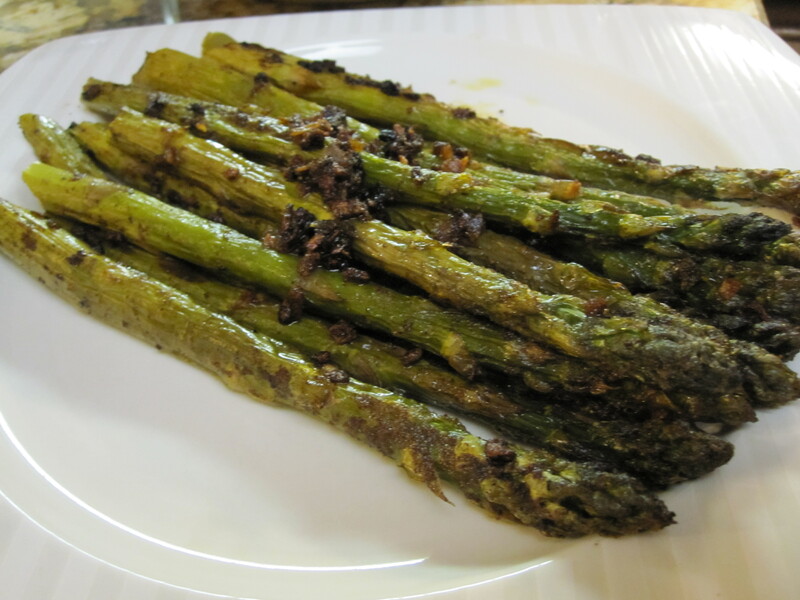 Directions: Wash and dry vegetables, place lettuce in bowl, add asparagus, which should be cut into bite-size pieces. Add chopped tomatoes, diced bok choy stalk, celery and red peppers. Toss to combine. 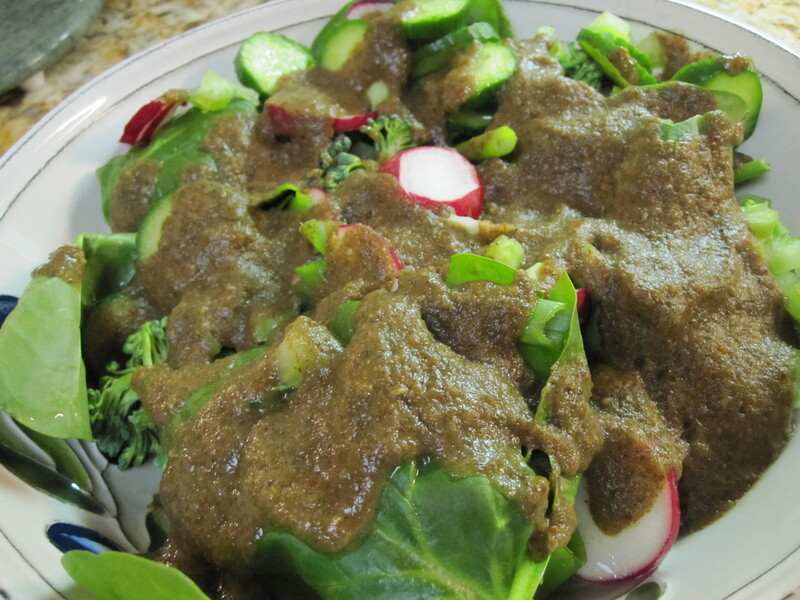 A raw dressing can be made by removing 1/3 of salad and placing in blender, and blend until creamy. 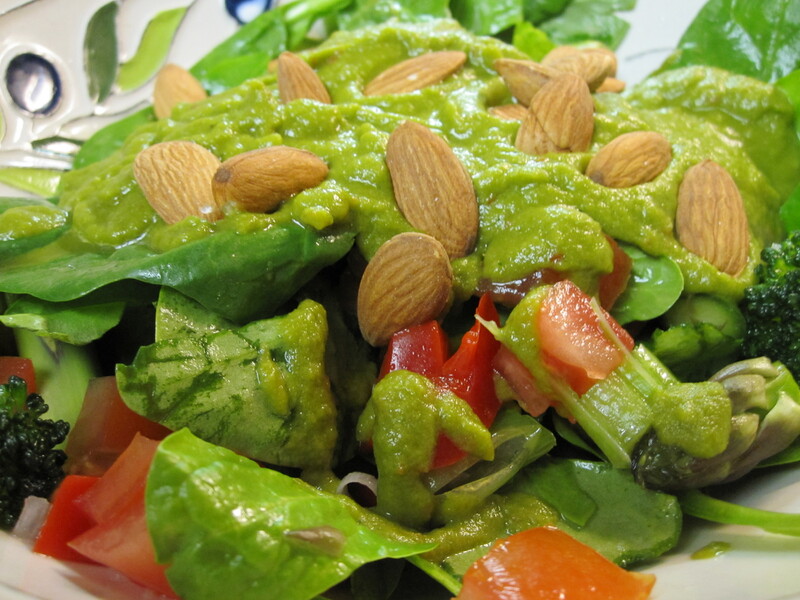 Sprinkle with grated almonds. 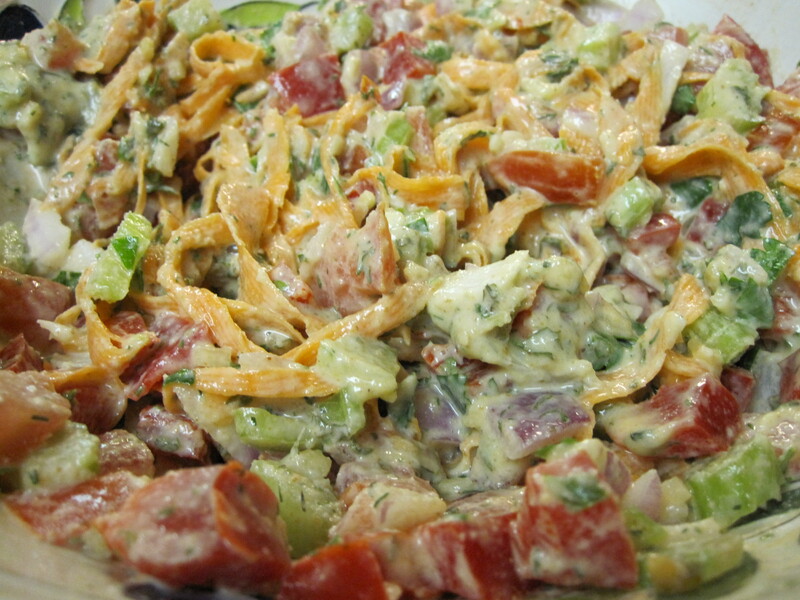 Directions: Finely chop the pepper, celery, onion and tomato, and place in a bowl. Finely grate carrots, resembling carrot pulp, and add the carrot to the vegetable mixture. 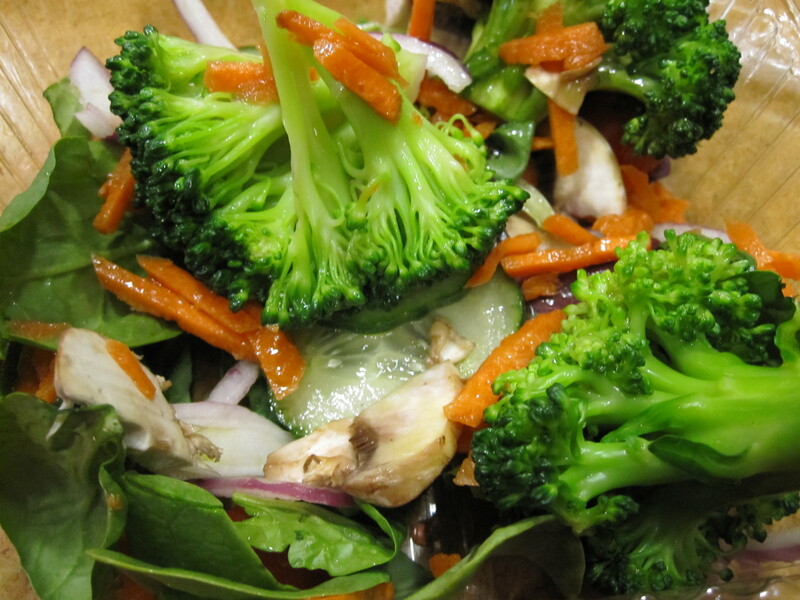 Combine 4Tbsp of Rhonda’s Dressing, Celtic salt, parsley and kelp and add to the above chopped vegetables. Mix well and allow to marinate for flavors to blend. May be served on a bed of lettuce, on a sandwich or to stuff a pita or tomato. Directions: Blend to mix and pour over vegetables and serve. I got up this morning for a 30 minute Pilates class… and I’m glad I did. I had too much food last night and plus I got a heavy workout that made me work this morning, when I didn’t want to. But again, I stopped off at the Starbucks across the street from the Pilates Studio to get, this time, a Tall Iced Chai Latte w/Soy. Mike and I are both doing office work this morning… and I haven’t even gotten to making my mid morning juice, or take my Barley Max Powder. So after this, I’m going straight to the kitchen to do so.! I ended up putting some Apples, Grapes and Banana together for my mixed Fruit Salad. I made some changes to the stacked salad.. instead of making a fresh salad, I ate the left overs from Mondays Mixed Garden Salad. I just added layered Cucumbers, and Carrots to the mix. Directions: Wash and dice, chop, and layer vegetables on top of Romaine lettuce or Green Salad. Directions: Dice Celery and onions, peel and cube tomatoes and potatoes, slice carrots and green beans, mince garlic, remove stems from parsley, if using fresh, mince. 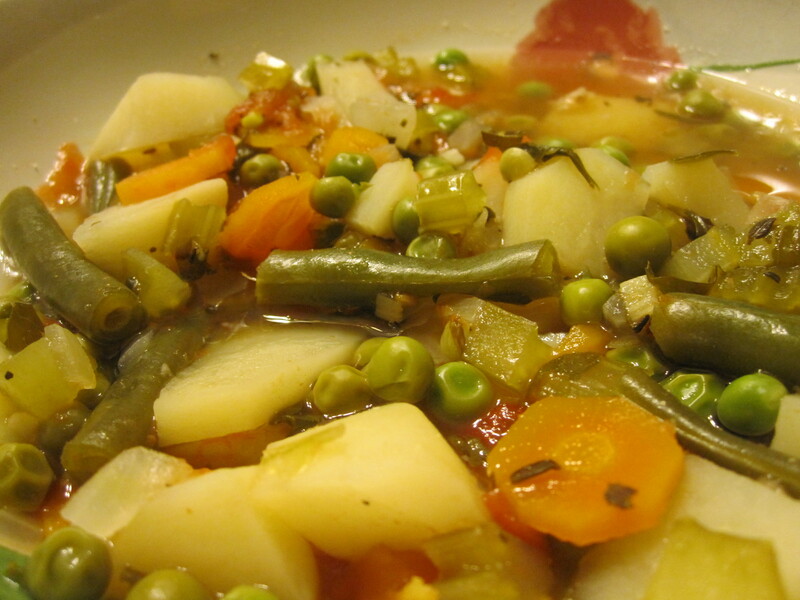 Steam saute vegetables in a small amount of soup stock until al dente. Add the rest of the soup stock and the seasonings, bring to a boil, cover and reduce heat to low. Cook an additional 30 minutes, add peas, cover and continue cooking 15 minutes. Serve in deep bowls with toasted whole grain bread.